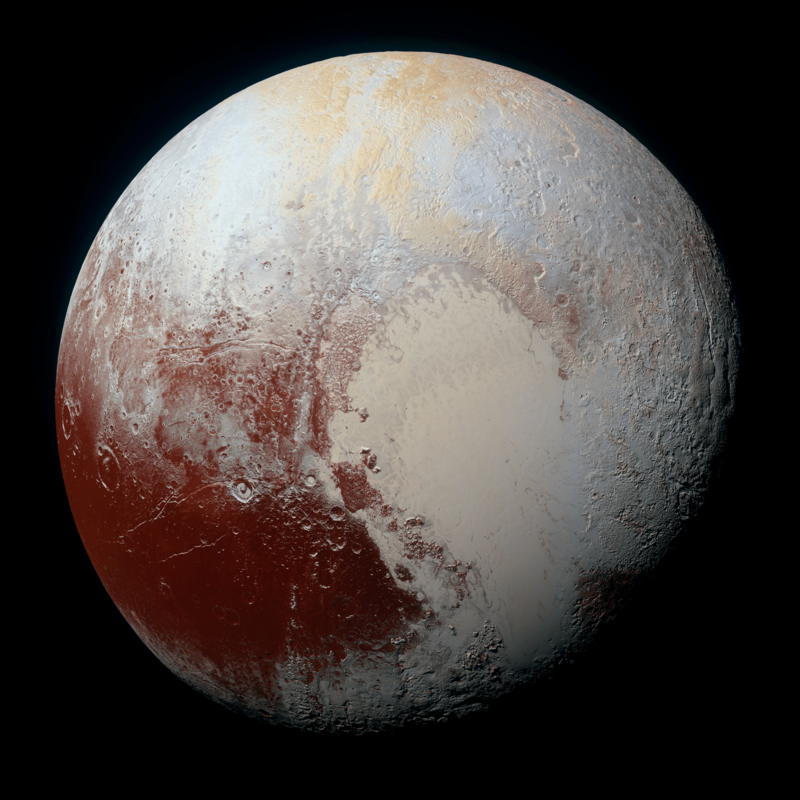 NASA released more new images of Pluto last Thursday, and, as has come to be expected, they are spectacular. The “snakeskin” image shows rippling terrain reminiscent of snakeskin or dragon scales, while other images show Pluto’s surface in the highest colour resolution yet. 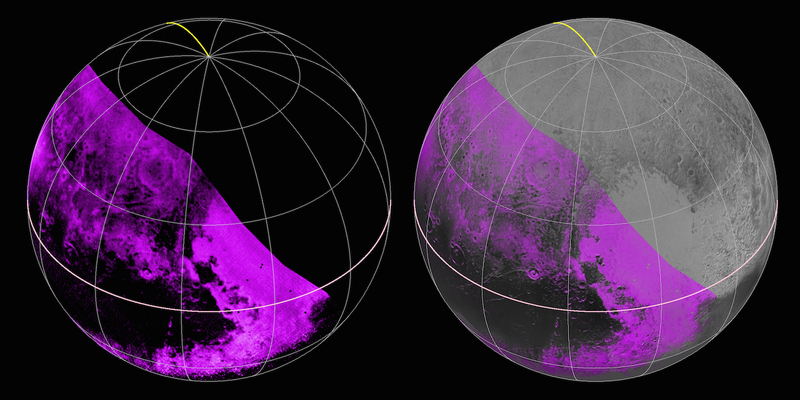 Spectral maps showing the distribution of methane ice on Pluto’s surface were also released today. The “snakeskin” image shows an area near the terminator, the division between the day and night sides of Pluto. It reveals another type of terrain not seen before on Pluto: a “rippled” landscape composed of long blue-grey ridges and other reddish material. This region of the ridges has been informally named Tartarus Dorsa. As with other recently seen features, the ridges are a surprise to planetary scientists. For such a small, cold body, Pluto exhibits some amazing geological activity, including the tall mountains composed of nitrogen ice and slowly flowing glaciers, also composed of nitrogen ice. In some ways, Pluto is similar to arctic regions on Earth, but the materials involved in the geological processes are completely different to what is seen on our own planet. Another “extended colour” image of Pluto, from New Horizons’ wide-angle Ralph/Multispectral Visual Imaging Camera (MVIC), shows the varied colors of the terrain great detail. The image was taken July 14, during the flyby, and downlinked to Earth on September 19. The incredible, full-resolution version of the image (70 MB) can be seen here. Zoom in to see all of the amazing detail! There are also new higher-resolution images of some of the terrain already seen before, including the mountains, glaciers, and possible dunes, in the Sputnik Planum region. The new high-resolution swath was taken by New Horizons’ narrow-angle Long Range Reconnaissance Imager (LORRI) on July 14 and downlinked on Sept. 20. 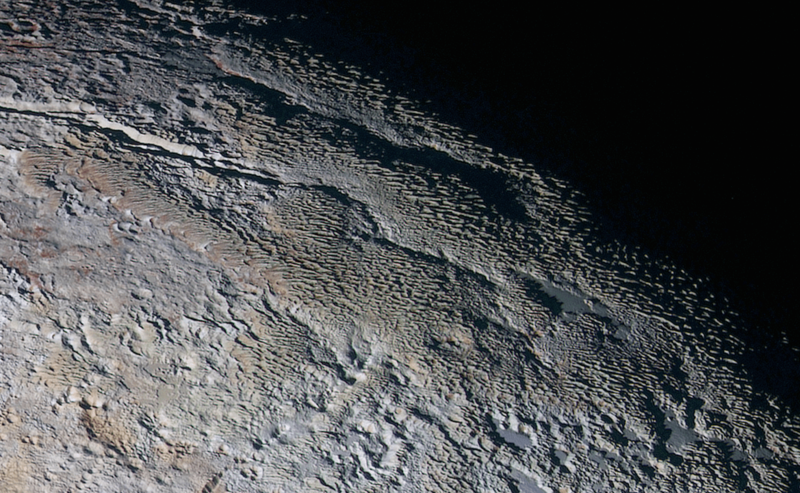 This arctic-like terrain can now be seen in the greatest detail yet, including small “pockmarks” or pits on the smoother terrain, ridges, and other scalloped features. As well as the new images, there is also a map of the distribution of methane ice on Pluto’s surface. Some areas, such as Sputnik Planum, show an abundance of methane ice, while other regions, such as Cthulhu Regio, show none, other than a few isolated ridges and crater rims. There is also a lack of methane ice on the mountains along the west side of Sputnik Planum. Pluto is also known to have nitrogen and carbon monoxide ices as well. Higher concentrations of methane ice are found on the smooth, bright plains and crater rims, but usually little or none inside craters or in regions of darker terrain. Another stunning, recently released panorama of Pluto shows multiple layers of haze in the dwarf planet’s thin atmosphere. The view is both beautiful and surreal. That image, also from New Horizons’ wide-angle Ralph/Multispectral Visual Imaging Camera (MVIC), was taken July 14 during the flyby and later downlinked to Earth on September 13. Surface-level haze or fog can also be seen, hovering among the icy mountains. Pluto really is a world in its own right. It was also recently reported that the nitrogen in Pluto’s atmosphere may originate from cryovolcanism, a cold, icy version of the volcanism we see on Earth. The new images and other data are revolutionizing scientists’ understanding of Pluto and its moons. They are part of a massive downlink of new data from New Horizons which will continue for another year. More incredible images from the flyby will be posted in the weeks and months ahead. New Horizons is continuing its journey deeper into the Kuiper Belt and will reach its next target, 2014 MU69, on Jan. 1, 2019. The Kuiper Belt is filled with thousands of smaller worldlets similar to Pluto. See the New Horizons website for much more information about what New Horizons has found so far.